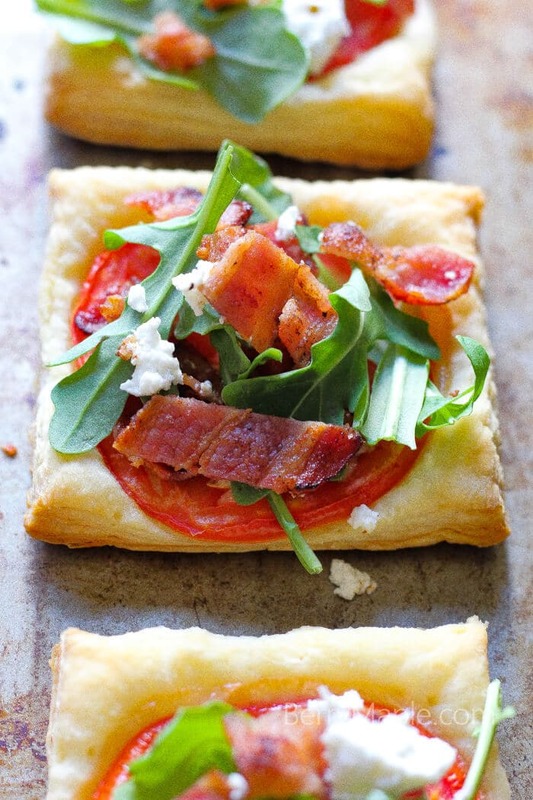 You will love this little (but very filling) BLT tarts with goat cheese! Surprise your guests and family with quick and easy appetizer. I created this recipe thinking of a BLT sandwich…easy and delicious, simple but so satisfying. Puff pastry can be easily found in your grocery store, in frozen section( if you don’t mind making your own its great, but i prefer to buy a premade dough- time saver). Cook your bacon until its crispy. Cover cookie sheet with parchment paper and oil spray( i used coconut oil spray). Move all pastry squares to the sheet and spread evenly. Cover each square with mozzarella first, then add tomato on top. Bake in the oven for 20 min. While tarts are baking, cook bacon . Place 3 stripes on a hot pan and fry until crispy. Once done, move to the paper towel until cool off and then chop. First, these look great. I would so eat them. Second, I think it is so awesome that you write your blog in two languages. You had me at BLT! You can pretty much add BLT to anything and I’ll eat it! These are just so darn cute too! Yum! almost looks like a pizza! I’m not a huge fan of the traditional chart. Too sweet for me. These savory tarts however I’m definitely going to be a fan of! Oh my word, what beautiful little tarts! You really can’t go wrong with anything “BLT.” Great recipe! These sound so delicious and easy! I love goat cheese! thanks! goat cheese is the best here! Those look delightful! Such a perfect little appetizer. This is a perfect little party appetizer! I can’t get enough tomatoes this time of year. They taste like sunshine! Definitely a great appetizer which is also simple to make and that my friend is an unbeatable combination! Such a fantastic idea for lunch or appetizers. Growing up, my dad’s favorite sammy was a BLT so they were a regular fixture in our house. This is a way more elegant version of that. What a nice, beautiful and simple bite your did there! Love the puff pastry crunchy base, and the fresh toppings! YUM! 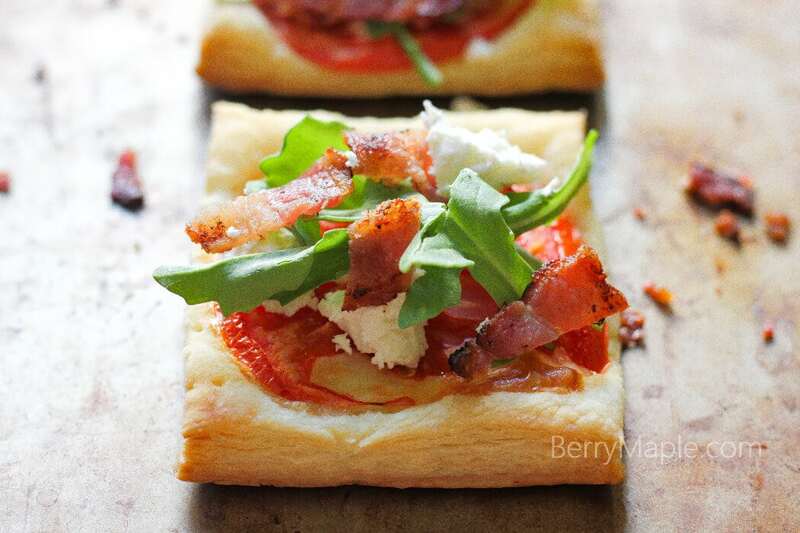 These are gorgeous tarts and I love how you use puff pastry as the dough. It is quick and easy to use! This is the kind of appetizer that I can make a meal out of. Perfect as a side along a salad. Pour me a glass of wine and call this dinner. What a great appetizer and I agree with you about the arugula, perfect for recipes like this. Perfect for when I host book club. What a great idea, I love a BLT ! 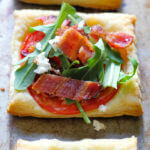 Your tarts look delicious and I like how you’ve used peppery rocket instead of lettuce, I really have to try these.